So after a notable absence from our screens Doctor Who is back with a complete refresh that not even Moffat had back in 2010 and this Premiere shows its already a very different beast to the NuWho that came before. Right from the start the show production wise is completely revamped from before, reaching a new level of cinema level quality that the Ecclestone days could only dream about. Rather than a sci-fi show this feels almost a thriller or ScandiNoir piece but that doesn’t stop the Sci-Fi elements from being the focus once they show up, the sharp dark lighting tones giving the electricity-based monsters a sharp contrast with the rest of the scene. Costuming is likewise also excellent even if what they’re about is fairly generic, though nothing too fancy was seen this episode which makes sense for the North of England. If there was one downside to this change however it’s that the music was barely noticeable throughout the episode. Murray Gold’s absence was always going to be notable but here the fresh start isn’t exactly graceful, with no real “themes” shown in the episode outside a brief motif that plays when the new Doctor first shows up, which is a damn shame. Maybe they’re focusing on the atmospheric stuff but so far I’m not liking it. Talking of the new Doctor I’m really enjoying her so far. She’s not perfect, a couple of scenes like the screwdriver creation coming across more forced quirkiness than natural, but overall her tone is coming across as Tennant or early Smith but at a far faster pace and it really does work well, with Whittaker’s gleeful glint in her eye adding to the delightful script . There’s also a hint of the Ecclestone/Capaldi darkness as well where she dispatches the villain fairly uncaringly after giving them a warning they didn’t heed. While the Doctor gets that ability to express herself I can’t say the same for the companions in this episode. It was always going to be hard given there are three of them but none really get a moment to shine, with Bradley Walsh’s Graham feeling rather boring which is a waste of the actor’s comedic abilities. Worst though is the use of Sharon D. Clarke as Grace who is killed near the end of the episode which feels rather forced motivation for husband Graham and grandson Ryan (played by Tosin Cole). Out of the three trainee police officer Yaz (Mandip Gill) probably has the most “moments” but so far a tad disappointing. Outside of the characters and humour the script was largely left at serviceable, not the first time in a series opener. There were a couple of nice scenes such as a drunk throwing his hated salad at the main villain but outside that it’s happy being a rather simplistic Predator clone. 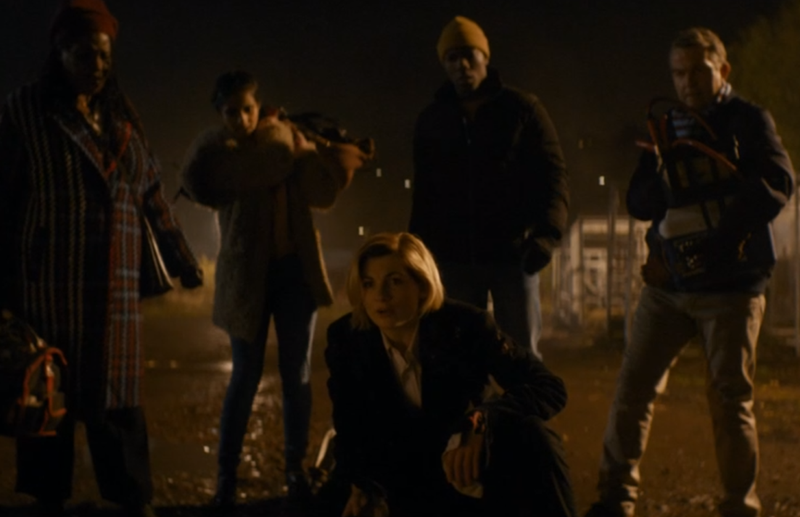 If there was one ballsy move by the episode though its definitely the fact this may end up being a TARDIS-less series entirely, with no hint of the fabled machine and the Doctor’s journey seems set up with her trying to find it. Given how much the TARDIS itself took centre stage in previous Doctor’s lives this is a big change. Overall it was a pretty solid if not the most amazing episode ever but a good setup to the new era of the show, which if the “coming soon” clip is to go by is very much going to be more diverse than ever before which could be very interesting if used well. A serious tone kept light by the dialogue could work well and hit the balance it tried to have with Capaldi but never really got, with the show the production values clearly a real shock to the system of traditionally schlocky BBC Sci-Fi. Just a tad more time for characters to gestate and a better soundtrack and this could be a return to the glory days.